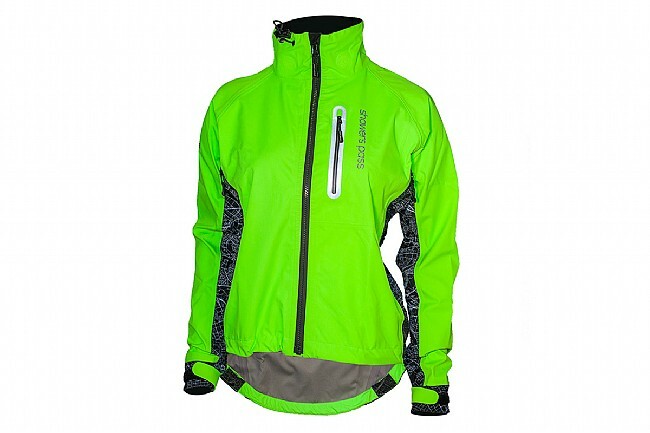 The Showers Pass Women's Hi-Vis Elite Jacket keeps riders dry and visible thanks to its neon green Event waterproof / breathable fabric, MapReflect side panels, and 4 integrated LED Beacon lights. All seams are taped to seal out road spray and downpours, but a proven venting system including a large back vent and zippered side vents makes sure air keeps flowing. A large zippered rear stow pocket can easily store a ride's worth of goods, and up front, the zippered chest pocket has a headphone port for stowing a smartphone or music device.